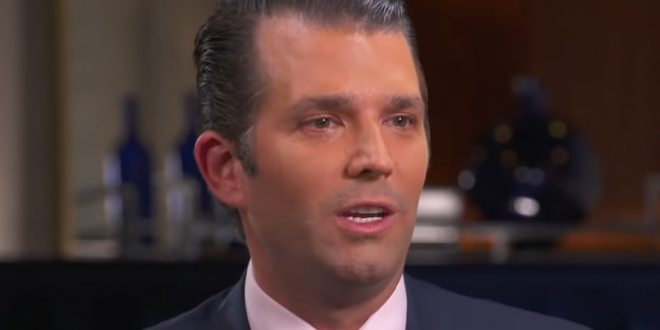 REPORT: Junior Is Worried He's Next To Be Indicted - Joe.My.God. Mueller now appears to be driving the West Wing agenda, with the principals in a reactive crouch; there’s a sense of loss of control. “It’s an untethered situation,” a person close to the president said. Donald Trump’s eldest son and other associates of the president may be at greater risk of prosecution after Robert Mueller, the special counsel, showed he is willing to criminally charge people for lying to Congress. Donald Trump Jr and Erik Prince, an adviser to the Trump campaign in 2016, made statements to Congress that have since been contradicted by public reports. Several more Trump allies testified to Congress on the Russia inquiry on a wide range of subjects. All deny wrongdoing. Adam Schiff, the House intelligence committee’s incoming Democratic chair, has said he will share transcripts from the panel’s Russia inquiry with Mueller for consideration of further criminal charges. Schiff said Republicans have so far declined to assist the special counsel.